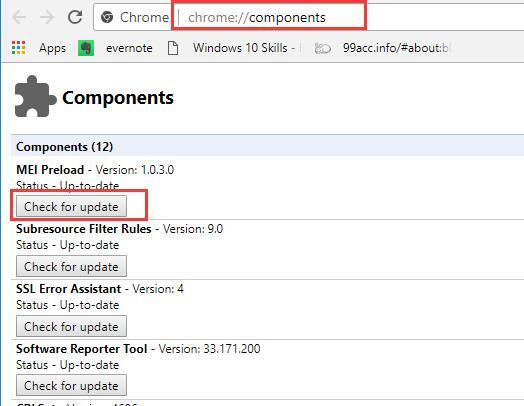 How to Update Chrome://Components on Windows 10? What is Chrome://Components Windows 10? How to Update Chrome: // Components on Chrome? How to Update Google Chrome to Update Chrome://Compontents on Windows 10? It is available for you to update Google Chrome application where there is an update released. But sometimes, so long as you have updated the Chrome to the latest version, the Chrome://components have not been downloaded along with the new Chrome Windows 10. For instance, you may need to update Adobe Flash Player in Chrome components individually if you wish to make use of the newest features or there is an error in Adobe Flash Player Windows 10. In this sense, you would better get down to updating both the Chrome software and most importantly, updating chrome://components Adobe Flash Player, widevinecdm, CRLset, recovery, File Type policies, Signed Tree Heads in Google Chrome. Google Chrome components, like chrome widevinecdm, Adobe Flash Player, CRLset, recovery, File Type policies, Signed Tree Heads, MEI Preload, and SSL Error Assistant in Google Chrome, are essential for chrome to run properly. 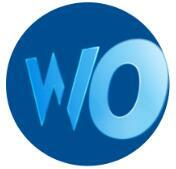 They are used to perform various tasks in Google Chrome and make chrome more convenient for you. To be more specific, here comes a detailed introduction to various chrome components. 1. The Adobe Flash Player is the plugin needed if you would like to open videos, audios in browsers, such as Google Chrome. Though it is built-in Google Chrome in recent chrome updates, there is also much need for you to update the Adobe Flash Player for Chrome in order to take advantage of new features of it. 2. WidevineCDM (Widevine Content Decryption Module), replacing the streaming videos, it is designed for DRM-protected HTML5 video and audio in Google Without it, Netflix will inform you that it misses a certain component, which is WidevineCdm in most cases. And if this Widevinecdm component is missing or outdated in Chrome, you are unable to watch Netflix videos since Netflix error M7357-1003 will appear. 3. Chrome component Recovery is used to repair Google Chrome installation or updating installation. 4. Swift Shader in Chrome can be regarded as a 3D render that enables you to use CSS 3D. After learning how they work in Chrome, let’s update Chrome components to enjoy their new functionalities or to fix various chrome issues, like Adobe Flash Player not playing YouTube videos. 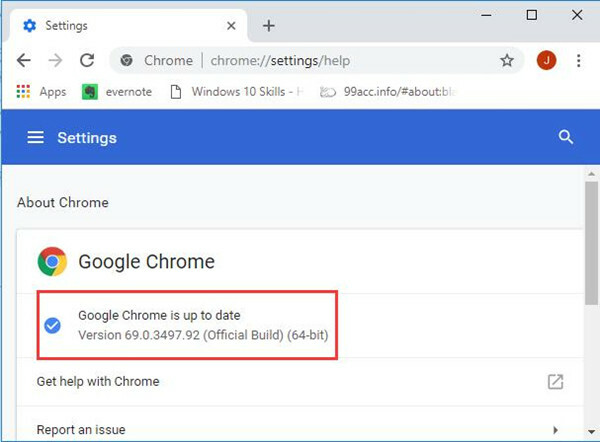 Now that you wish to get chrome components updated, it is understandable that you first choose to enter chrome://components updating page to download the latest chrome component versions. If you feel like to update Adobe Flash Player in Chrome or want to fix Netflix not working error, come here and follow the steps below to accomplish that goal. At first, enter the chrome://components page and then learn how to update chrome components Adobe Flash Player and Widevine Content Decryption Module on Windows 10. 1. Open Google Chrome application from your Desktop. 2. In the Google Chrome search bar, input chrome://components and press Enter. Here you need to make sure you have entered the right URL for entering chrome components, be careful not to type the site as chrome//components or chrome:components or chrome/components as others can bring you to chrome components updating page. 3. 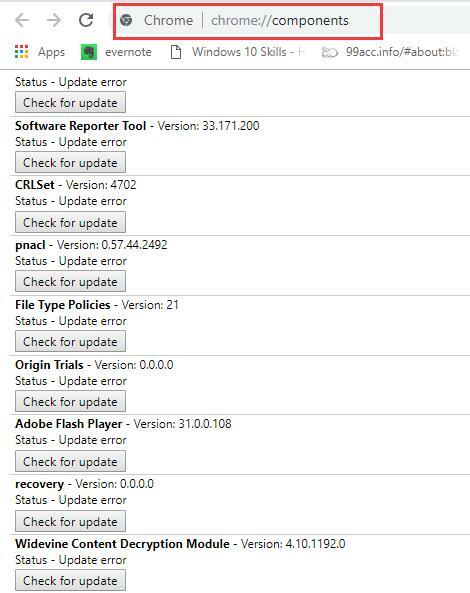 Then you can find out the chrome components you would like to update and click Check for update to update them individually. Here for most of you, you need to locate Adobe Flash Player and Widevine Content Decryption Module and check for their updates. As for other chrome components, do the same. If Chrome components Widevinecdm and Adobe Flash Player are updated, the Netflix error M7357-1003 or Adobe Flash Player blocked can also be fixed successfully. If chrome://components not updated, it implies that something prevents you from updating Adobe Flash Player and Widevinecdm and you have to try to update Google Chrome so as to update components for Google Chrome on Windows 10. How to Update Google Chrome to Update Chrome Compontents on Windows 10? It is said that installing an updated Chrome would also update chrome components, such as Adobe Flash Player, Widevine Content Decryption Module, and Pepper flash. From this perspective, an updated Google Chrome is capable of fixing your Chrome high CPU or any other errors on Windows 10, for instance, WidevineCDM component won’t update on Windows 10. For other browsers like FireFox and Microsoft Edge, you can also choose to update the browser to remove Adobe Flash Player not working. The quickest and most direct method to update Google Chrome is to download the application in the browser itself, as it has been mentioned, Google Chrome will give off updates at intervals. 1. Double click Google Chrome on your Desktop to open it. 2. In the Google Chrome search bar, enter chrome: //chrome and then press Enter. 3. 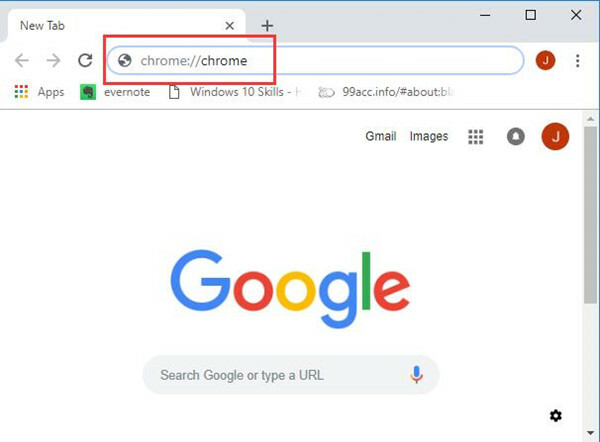 Then you will have entered another webpage of chrome: //settings//help, here hit Check for Update to update Google Chrome app on Windows 10. If you have already updated the Chrome to the latest version, you will see Google Chrome is up to date instead of Check for Update. Then you will be required to close Chrome and restart it again. This time, on the new Google Chrome, Chrome not updating or Netflix not working will be removed. 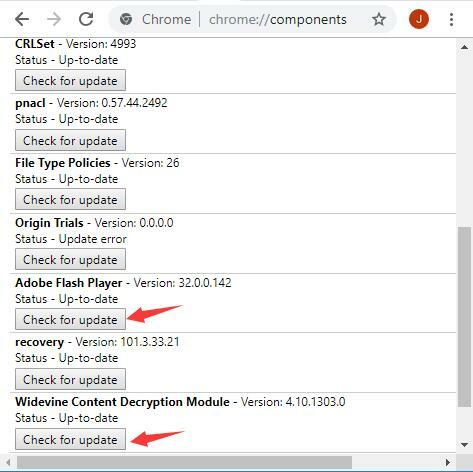 In terms of certain specific chrome component error, for example, Widevine Content Decryption Module missing or Adobe Flash Player not installing on Windows 10, try again to update the individual chrome components Widevinecmd or Flash Player in Chrome://Components page on the brand-new Chrome. To conclude, no matter you are to update Chrome://components for sake of using the new features or dealing with various chrome issues, it is foolproof. You can rely on the procedures above to fix chrome components won’t update, or Netflix expected error Windows 10.